I was feeling like something sweet this morning. It was probably more habit than actual appetite. Normally on my low-carb high-fat diet I don’t feel like anything sweet. The diet tends to suppress the appetite for sweets, so I don’t find myself craving a lot of things. But it was a hot, lazy morning, and I didn’t want anything complicated. 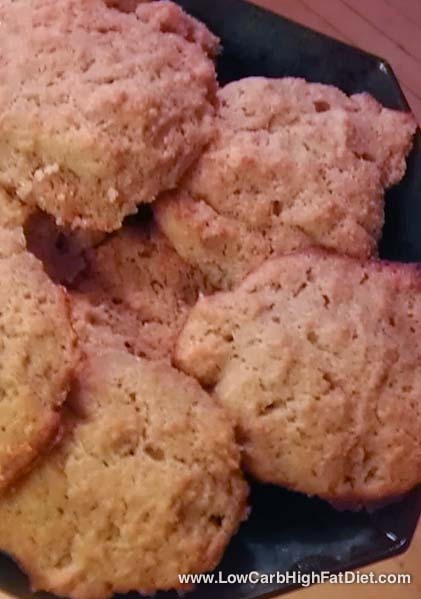 The convenience of a sweet cookie and a glass of iced tea sounded like the perfect thing. I’ve been looking for opportunities to try some more experiments with coconut flour. This is becoming one of my favorite ingredients. 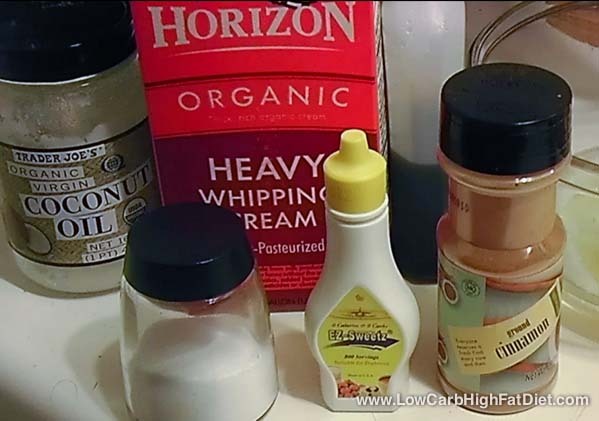 It’s great for frying, baking, and even thickening sauces if you use it right. Coconut flour doesn’t behave the way that you would expect it to. It’s very dry, and absorbs liquids very quickly. It also doesn’t have a lot of coconut flavor, which is surprising and sometimes very convenient. I tend to pair it with coconut oil in order to emphasize the coconut flavor. I also like to mix it with coconut milk. So today I decided to experiment with a coconut flour cookie recipe I’ve been thinking about. 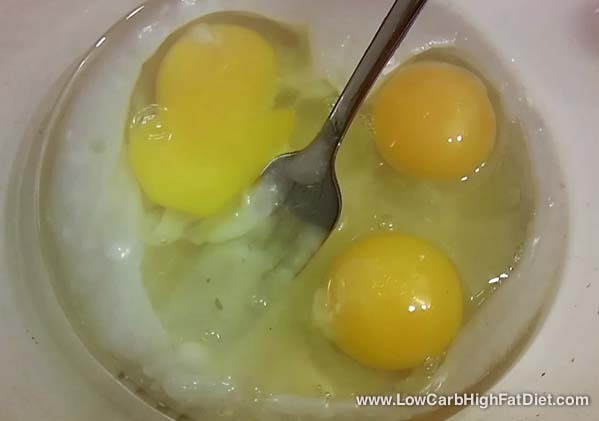 I started by whipping three eggs with a quarter of a cup of melted coconut oil. I added a half cup of heavy cream diluted with water. I used a mixture of heavy cream and water because I wanted to add some extra moisture in order to take the best advantage of the coconut flour. 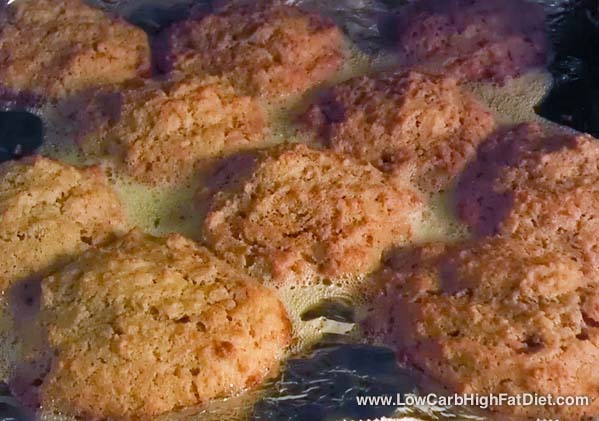 I mixed in 15 drops of Splenda liquid to the mixture, tasting as I went, but you can try other sweeteners if you like. I also added a half teaspoon of vanilla, and a sprinkling of cinnamon powder. In my mind, I imagined that these might be a little bit like snickerdoodles. Then I whisked a dash of salt into a third of a cup of coconut flour, and added that to the mixture. The batter came together nicely, and I dropped it by tablespoons onto a buttered baking sheet. I baked the mounds of batter at 350°F for 15 minutes, until the cookies looked like they had spread and browned nicely. 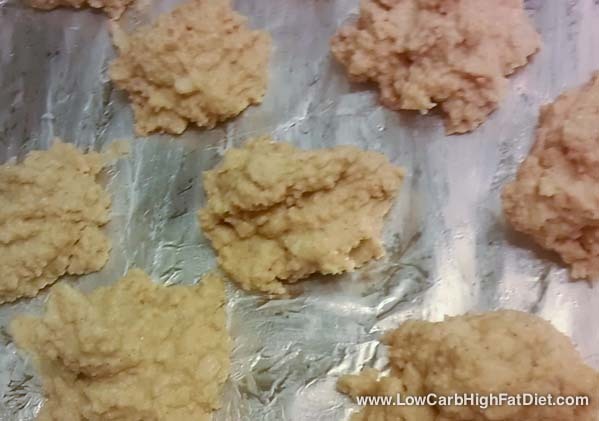 The coconut oil seeped out onto the baking sheet, frying the edges of the cookies, but it was re-absorbed as they cooled on the sheet. Like most low-carb baking recipes, they stuck to the foil and had to be lifted off with a spatula. They’re also pretty delicate, so next time I’ll probably use a silicone baking sheet. 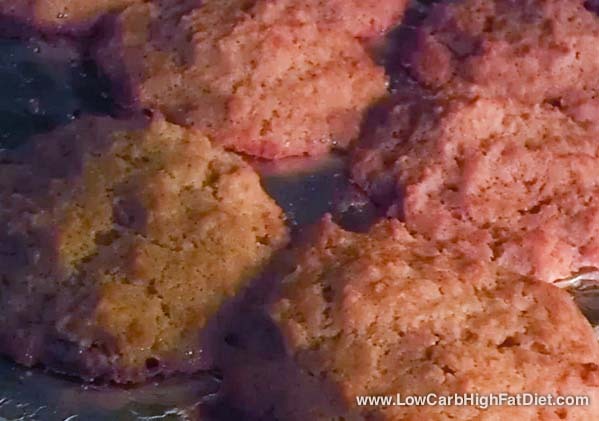 They ended up a little like a cross between soft cookies with a crispy edge, and perfectly baked muffin tops. The nice thing about coconut flour is that you really don’t have to limit yourself when eating things made with it. 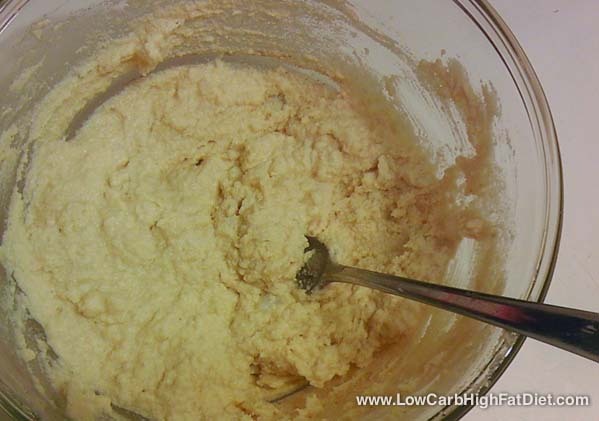 Coconut flour is just ground dried coconut meat, which is very high in fiber and very compatible with low-carb eating. 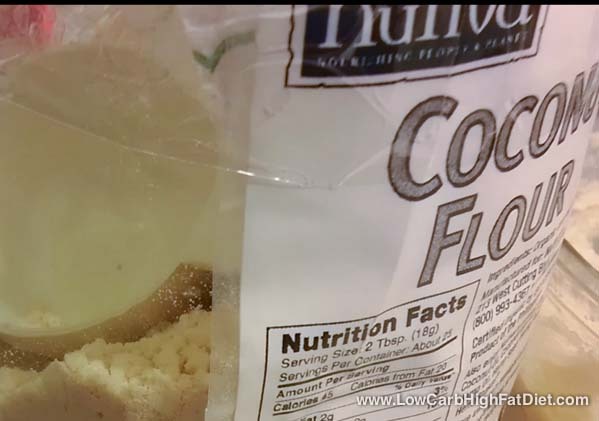 As long as you get the unsweetened kind, coconut flour perfect to eat on a low-carb high fat diet. It also provides many of the nutritional benefits of coconut itself.